About | — Community. Code. Collaboration. I am co-authoring The Compassionate Coder, a guide to practicing empathy as a software developer and business leader. You can learn more about the book at compassionatecoder.com. "In its simplest form, Isle of Ruby is a Ruby conference . We aspire though to create something bigger — a festival of sorts. A festival for our craft — for technology and for Ruby, our programming language of choice." "Technology does not exist in a vacuum. While Isle of Ruby wants to be a Ruby conference, it also wants spur on members of our community to consider how the work we do affects the world around us." An extraordinary community came together to discuss the big questions in programming this spring in the countryside in the U.K. I spoke about Ruby Prototyping for Impact Projects. Read the accompanying "Privacy by Design" post that came out of my talk. See more Isle of Ruby here. You're going to be hearing a lot more about this as we move towards launching. I am co-authoring a book on Software and Empathy. Get the full story here. You can also support the book and get sneak previews of the chapters, discounts on swag and other surprises by subscribing here. Interviewed for my first podcast! I love trying new things and was beyond excited when Espree Devora invited me to be interviewed on her Women in Tech Show podcast, special Irish edition. The theme of the show is "If She Can Do It, So Can I". I was so there for it. We chatted about how to get into tech from another field, finding the courage to make the leap and talked a bit about co-working in Ireland. Take a listen! Just click the image above; you can also download it on iTunes. Rails Girls Dublin 2017 is one of my proudest moments (weekends). These fine folks in the photo are my co-organizers: Elaine O'Carroll, Sheeka Patak, Wojtek Borowicz and Serena Fritsch. I have done lightning talks, Coached and led workshops with Rails Girls for 4 years across many cities and am so glad I got to bring the magic to Dublin and help organize one myself. 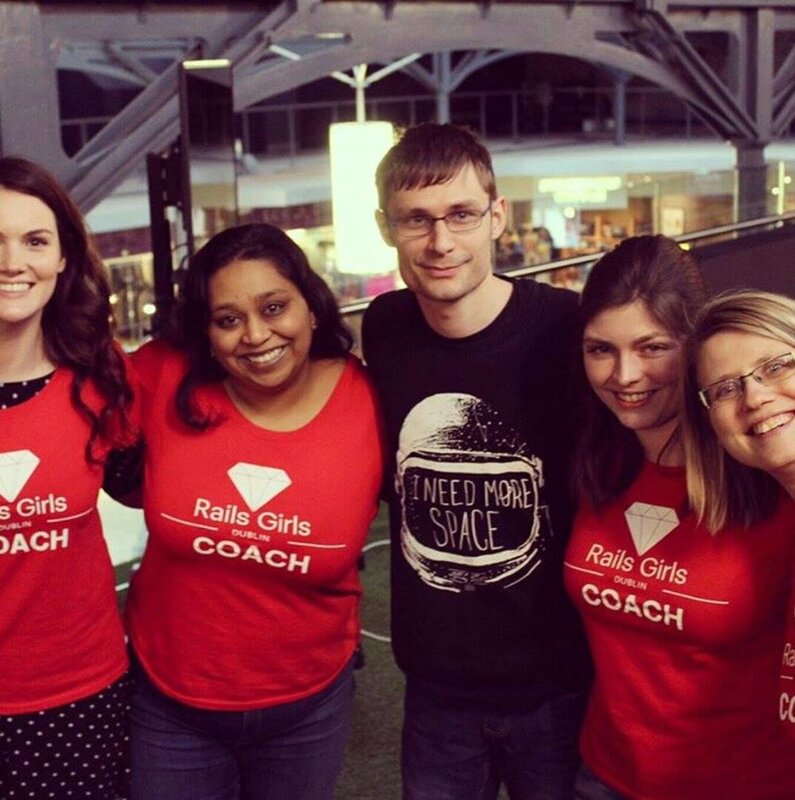 60 ladies spend 2 days learning the basics of Rails and programming in general. It's not just about the coding though. It's also about building a community with local meet-ups, expert programming Coaches and the attendees. RBC is one of the big banks in Canada, and it is an extraordinary honour to be included on their Canadian Women Entrepreneur Awards Women of Influence nominee list for my work as Co-founder and CTO of Heuristext, where I prototyped an artificial intelligence program that went to the Valley. "The RBC Canadian Women Entrepreneur Awards is the premier national awards program celebrating the achievements of the most successful in this inspiring group. Over the last 25 years, thousands of women have been nominated and recognized for demonstrating excellence — from economic growth to social change, from local to global reach, across multiple sectors. The collective impact of our country’s female entrepreneurs cannot be overstated. We are honoured to shine a spotlight on them." Thank you RBC. Thank you Canada. Thank you to my nominators. One of the great joys of my work is getting out in the community and chatting with teen girls about possibility, technology, and their future paths. It's hard to see this is me in this one, but here I am taking a power stance before going on-stage in the Entrepreneur Zone at iWish (Dublin). It's a conference meant to leverage findings about teen girls and STEM: most are seeking a career with purpose, and they can't connect purpose and STEM. iWish works with them and helps them see purpose and meaning in STEM careers. I talked to a group of about 40 teen girls about hustle, what entrepreneurship looks like as a career path, perseverance, and failing one of my senior level maths courses. To my great delight, a couple of the girls I connected with still follow-up with me as a kind of mentor and ongoing coach. I got to have a chat with a Transition Year class as a Role Model with the Ada Lovelace Initiative. The Ada Lovelace Initiative pairs women in tech with high schools as a role model who goes in and talks about her career. We chatted about my non-traditional career path, my experience in an accelerator in Silicon Valley, the day-to-day mechanics of working in technology, harnessing confidence by any means necessary and career options (just because you want to go into Law doesn't mean you can't be in Technology - see: patents lawyers). Link to the full article when you click on the picture!